The wording of requirement 6a has an editorial error in the 2018 Boy Scout Requirements Book. The correct wording is shown below. b. Using a chart, graph, spreadsheet, or another method approved by your counselor, demonstrate your understanding of each aspect of emergency preparedness listed in requirement 2a (prevention, protection, mitigation, response, and recovery) for 10 emergency situations from the list below. You must use the first five situations listed below in boldface, plus any other five of your choice. Discuss your findings with your counselor. Meet with and teach your family how to get or build a kit, make a plan, and be informed for the situations on the chart you created for requirement 2b. Complete a family plan. Then meet with your counselor and report on your family meeting, discuss their responses, and share your family plan. Touching a live household electric wire. Drowning using nonswimming rescues (including accidents on ice). How a group of Scouts could volunteer to help in the event of these types of emergencies. Take part in an emergency service project, either a real one or a practice drill, with a Scouting unit or a community agency. 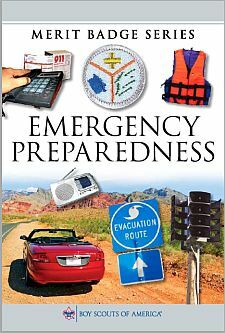 Prepare a written plan for mobilizing your troop when needed to do emergency service. If there is already a plan, explain it. Tell your part in making it work. Group feeding, shelter, and sanitation. Prepare a personal emergency service pack for a mobilization call. Prepare a family kit (suitcase or waterproof box) for use by your family in case an emergency evacuation is needed. Explain the needs and uses of the contents. Using a safety checklist approved by your counselor, inspect your home for potential hazards. Explain the hazards you find and how they can be corrected. Review or develop a plan of escape for your family in case of fire in your home. Develop an accident prevention program for five family activities outside the home (such as taking a picnic or seeing a movie) that includes an analysis of possible hazards, a proposed plan to correct those hazards, and the reasons for the corrections you propose.